Appearing on the one hand to be a post-modern Apocalyptic Cult, Sleepytime Gorilla Musem delight in setting folksy allegorical tales of auto-genocide and the species-wide doom we all face to breathtakingly strange and compelling musical compositions. SGM’s impressive instrumental array includes many homemade devices suggestive of the avant-garde. 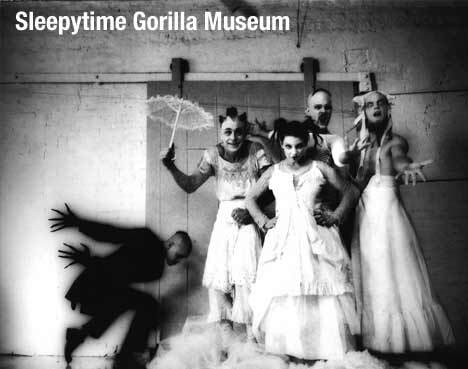 Having little in common with those who have marred the field, whether mere arty obscurists, jock-like musical gymnasts, or high-brow snoots, Sleepytime Gorilla Museum are thoroughgoing populists, warmly regarding their varied audience and skillfully embracing their role as entertainers. Even though the band boasts heavy-hitters like Carla Kihlstedt (Tin Hat Trio) and Nils Frykdahl of Faun Fables, this is a band that survives and thrives supremely through heavy touring, and in the process has amassed a devoted (to say the least) following. For a band that owes as much to Meshuggah as they do to the Art Bears, Messiaen, and Einstürzende Neubauten, their skewed exhumation of Futurism in reverse strikes a broad nerve and fills a big void – in the process SGM’s music has become dear to many many hearts. 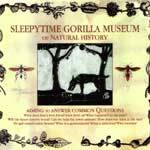 official sleepytime gorilla museum website. A landmark release in the tradition of absolutely no tradition, a destined classic. With this, their Mimicry debut, Sleepytime's musical method has evolved, as natural things will do, and delivers what can only be described as a complete and thoroughly devastating musical expression. With their dense harmonic compositions & and jagged, intricate rhythms (by FAR the best in the business on both counts) servicing the artistic equivalent of a Unabomber tract set to music, the music collected in the Museum of Natural History sets a serious high water mark for future generations to look back on in awe… assuming the existence of future generations, that is. What Shall We Do Without Us?